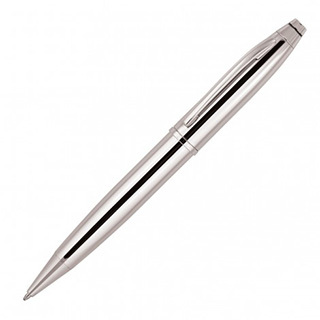 The metal barrel of the Lancelot Metal Ballpoint Pen shines brightly in chrome brilliance. A very classy executive number, this twist action, retractable ballpoint supplies black ink from a Cross type refill with a 1.0mm nib. Decorate this promotional gift with an elegant champagne finish engraving to the cap, or pad printed logos can be pad printed to either barrel or cap giving plenty of branding options.